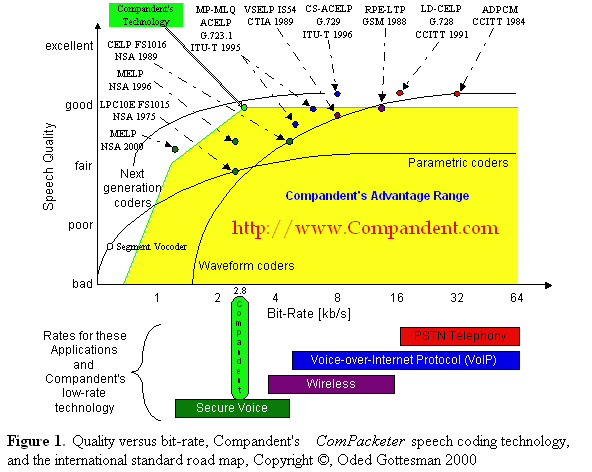 Compandent's ComPacketer is a voice coder which achieves a breakthrough in quality/bit rate/complexity tradeoff. Compandent’s novel technology, the ComPacketer that operates at 2.8 kb/s, produces speech with quality which exceeds that of ITU-T G.723.1 at 6.3 kb/s, which is widely used for VoIP. Its performance is demonstrated in Table 1 below. Using the ComPacketer, only graceful degradation is introduced in frame erasure environment, as compared to the higher quality degradation introduces by the common standards used for VoIP. Due to the increasing number of users and services, particularly in wireless applications, severe limitations are imposed on the bandwidth available for voice. The use of Compandent’s low bit-rate technology will allow a larger number of users, and a wider bandwidth for data, or for more bandwidth-demanding applications such as video. 1. The ComPacketer is naturally very suitable for error concealment applied to packet loss or frame erasure situations, and may therefore be very suitable for Voice-over-IP and wireless applications. Its performance is various Frame Erasure Rates (FER) is demonstrated in Table 1 below. 2. The ComPacketer is naturally very suitable for parametric processing, such as pitch scaling, and slow or fast playback (time scaling). Table 1. Demonstration of the 2.8 kb/s ComPacketer's quality at various Frame Erasure Rates (FER). * Note, that the no additional buffering delay was used at the decoder for error concealment. Future demo will demonstrates the additional improvement obtained by such buffering. Figure 1 illustrates the range of performance advantage of Compandent’s ComPacketer with respect to the standard technology used by our competitors in the fields of secure voice, wireless, VoIP and Public Switched Telephone Networks (PSTN). For example cellular phone uses 8-13 kb/s (kilo bits per second), standard telephone uses 16-64 kb/s, hence the ComPacketer's transmission rate is about 1/4 - 1/3 compared to cellular phone, and 1/24 - 1/6 compared to standard telephone. Even the current standard coders used for Voice-over-IP and multimedia applications operate at rates as high as 5.3-6.3 kb/s (G.723.1) to 8 kb/s (G.729). Table 2 and Table 3 summarize the results of subjective tests conducted to compare the ComPacketer to ITU-T G723.1 coder. The results indicate that the subjective quality of the 2.8 kb/s ComPacketer exceeds that of G.723.1 at 5.3 kb/s, and it is slightly better than that of G.723.1 at 6.3 kb/s. Table 2. Results of subjective A/B test for comparison between the 2.8 kb/s ComPacketer coder to 5.3 kb/s G.723.1. With 95% certainty the result lies within +/-5.53%. Table3. Results of subjective A/B test for comparison between the 2.8 kb/s ComPacketer coder to 6.3 kb/s G.723.1. With 95% certainty the result lies within +/-5.59%.